Right as we're hearing rumors that the Galaxy Gear 2 will premier at MWC 2014 on February 24, we're seeing the first Samsung smartwatch receive deep discounts from retailers. Best Buy is currently selling select models of the Android-based Galaxy Gear today for $149 (about £90/AU$165) when it had previously cost $250 (about £151/AU$277). Typically, when there's a fire sale like this, it means a manufacturer is ready to introduce a new product to take the place of the original. Retailers are left to quickly try to offload existing stock. Curiously, today's Best Buy deal only applies to the colorful and unsurprisingly less popular Gear models with Wild Orange, Rose Gold and Oatmeal Beige bands. American carrier AT&T is also indicating that time is running out for the first Galaxy Gear. 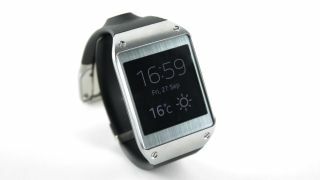 A deal to bundle the smartwatch with its top-selling Samsung phones is under way. AT&T is chopping $100 (about £59, AU$110) off the Android watch if it's purchased alongside the Galaxy Note 3, Galaxy S4, Galaxy S4 Active or Galaxy Mega. Conveniently, it's even offloading the discounted Galaxy Gear to people who bought one of these devices recently, and colors include black and silver in this scenario. It's not a stretch to think that today's Best Buy and AT&T sales are another big hint that Samsung is ready to replace the struggling wearable. It's been rumored that the Galaxy Gear 2 has a radical new flexible design, may be lighter than the first model, will sport a cheaper price and is destined to launch alongside the Galaxy S5. MWC 2014 would be the right time and place for an unveiling. Samsung naturally wants to launch before Apple's iWatch, HTC's confirmed wearable and the rumored Google smartwatch. With the classy looking Pebble Steel already turning heads and Sony sporting its Android smartwatch sequel via the Sony Smartwatch 2, Samsung shouldn't be far behind. See the renders of what the Galaxy Gear 2 should look like.